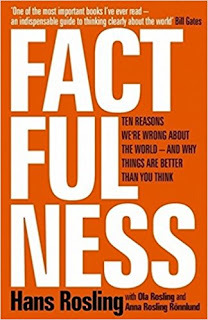 FACTFULNESS: Ten Reasons We're wrong about the world - and why things are better than you think by Hans Rosling (2018) with Ola Rosling and Anna Rosling Ronnlund, Hachette - Sceptre, UK, p 342. Some fifteen years ago a renowned practicing psychologist in Philadelphia was interacting with me and I asked him about his experience of India and to my utter surprise he shared some of the bad memories he had while he visited Bombay (Mumbai). He told me it is overcrowded, beggars all over the places, corruption, poor law and order etc., etc. I didn't want him to continue further, so I intervened and inquired when was it, I mean the year, he tried to figure out the year but unable to recall he said it was sometime in early 80s. I just told him, things have changed a lot in India and in Mumbai. India is not same as before. As world has changed, India has changed positively too. But at the back of my head, I got into thinking as to how we tend to form our opinion about places and people and what drives our bias towards what we think. We see things from the experiences we have and get so possessed that we forget transitions overtime and our perspective lands into narrowness. Most of us commit this error unknowingly and accordingly our perceptions and decisions are affected. Many a times they are far from reality. It is in this background when I read a brief about Factfulness and saw TED talk by Hans Rosling, I was driven to go through the book. Bill Gates has been a great admirer of Hans Rosling and his way of looking at future on the basis of facts. He states that it is one of the most important books he has ever read and that's why his charity is giving a free eCopy of this volume to all graduating Americans this year. Factfulness is based on some of the most interesting questions each one of us should have and try to find answers of when we are interacting with the new world. Most of us tend to believe that the world is getting worse year after year. We have heard lot of stories from our elders that their days were better. Media keeps writing fascinating stories about the dark days we are living and going to face in the future. Most politicians capitalize on our ignorance and preposterously play with our emotions. The policy makers get myopic while designing policies. So we form our perception on the basis of what gets written about, what people around us talk about and what was told to us long back or we saw long back. Interestingly, most of the times we do not dig into data and try to know whether what is being served to us is correct or not, or what is the reality behind. Hans Rosling along with Ola Rosling (son) and Anna Rosling Ronnlund (daughter-in-law) provide us guided tour through an unusual quiz and provocative puzzles which make one realize number of times that chimpanzees think better than a human being. His arguments are exemplary and as a physician and expert on global health, his grip on health issues and defense that we are in much better condition as compared to the past, assures that things are not bad but perceptions are. So better if we try finding facts and data and use some little analysis to form an opinion which can help us think better and make better policies. Though there are only 13 questions as such which are the basis of the whole argument that the world is getting better, there are many other questions which the book answers through the narratives to the social milieu. Like many of my generation people, I grew up with the binary classification of the world - developed and less developed or poor. Later the World Bank started classifying the world in four categories, viz., Low income, Lower middle income, Upper middle income, and High income and we began to see the world in different way. Never knew that it was Hans who was trying hard to break the binary and could successfully convince the World Bank to expand in four categories. In this book all the questions are answered from the perspective of four categories as Level 1, Level 2, Level 3 and Level 4. Countries are moving from Level 1 to Level 4 exponentially (Soon, most people on Level 4 will be non-westerners) and this volume is an exceptional tribute to the changing world where we see lot of improvement in health indicators (88% immunization, 70 yrs of Life Expectancy) globally. It might sound unbelievable but it is heartening to know that 90% girls go to school globally. Personal experiences are beautifully corroborated by the author and the way the whole book is written shows the passion of the team towards the cause of providing clarity based on facts which otherwise get maimed. As individuals and institutions we need to draw policies and strategies, design products and services, provide solutions and make systems for the organisations and market of tomorrow and if they are based on the facts which could be extrapolated for the future, we shall be preparing for better future, mind it, Societies and cultures are not like rocks, unchanging and unchangeable. We can not use old glasses for new challenges and very strongly we need to come out of archaic thinking based on mere observations or hearsay, we need to get to look for reality through data so that we see the future more clearly. Though Hans Rosling could not see the release of the book as he left us in Feb 2017, the kind of awareness he has created and legacy he has left, I am sure it shall go a long way in helping all of us to understand the world better. It shall be a true tribute to him if we all become possibilists as he used to call himself. I wish the person I met in Philadelphia shall appreciate the changes that and amend his opinion about India which was nothing but a crude generalization. The book is written in a very reader friendly manner. The visuals are unique and never-before type and are simple to understand. It diagnoses problem, prescribes solutions and cautions the reader to not get carried away with the crowd. The book is very prescriptive and that is the best part of this book. Factfulness is an insigthful sojourn into the world of optimism, possibility and positivity. The passion Hans Rosling has reflected in writing this book makes it an interesting read for everyone. For policy makers, students, academics, business community, civil society, challengers, complainers, politicians - for almost everybody, this volume tries to explore and provide an answer to use better informed, fact based yardsticks. All who are interested in the future, more than the present and past, shall enjoy it thoroughly.